From AirVape by Apollo comes a whole new vaporizer, one that is ultra powerful, yet so small, you'll wonder how it's able to deliver such potent, flavorful vapor. Truly one of the best on the market today, this portable unit lets you enjoy your favorite dry herb blends and offers a convenient cup for vaping concentrates. The AirVape Xs Vaporizer will truly change the way you vape for the better. Easy to hold in your hand, it is sleek and beautiful and is crafted from aluminum to provide durability and strength. There is an LCD display screen that showcases the temperature and battery life, to make it clear what is going on inside of the unit. It also comes with a number of accessories that make vaping a dream. Apollo is a vaporizer manufacturer focused on customer service and top quality. In Greek mythology, Apollo was known as the god of medicine and the arts - a healer and an artist. Staying true to their namesake, Apollo brand vapes are as aesthetically pleasing as they are able to accommodate any materials you put into your vape. Their team of experienced designers and manufacturers includes Rolan Szegi, an expert product developer that was once the owner of Vaporize101, and has extensive knowledge on the topic of vaping within the handheld vaporizer industry. AirVape Xs vaporizers are much slimmer than conventional portable models, so they can be tucked away in your pocket as easily as a smartphone. Sleek and stealthy, the vape is the thinnest handheld on the market today, but it's sturdy enough to be backed by a lifetime warranty. It's truly the last wax and dry herb vaporizer you'll ever have to buy. In most reviews, the AirVape Xs consistently earns top marks for its efficient performance and incredibly high quality vapor. The AirVape features an advanced heating system that allows you to benefit from both convection and conduction. Herbs are initially heated directly to get vapor flowing right away, then, hot air circulates through the chamber to ensure even vaporization and keep the vapor flowing with no stirring required. Its ceramic chamber and glass mouthpiece keep vapor as pure as possible. - Mouthpiece - a replacement mouthpiece that comes standard with the Apollo Airvape XS should anything happen to it. - Wax Cup - slides in where the mouthpiece goes and transforms the vape into one that is compatible with waxy concentrates! - Shell - a water-resistant case that protects the AirVape Xs from the elements, no matter where you end up taking it. 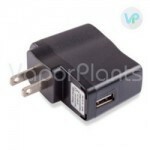 - Charging Dock - for charging the unit upright and on display. - Magnetic Charger - features a micro USB end that connects magnetically to your charging cable for your convenience. - Power Bank - can be taken on the go to charge your vape anywhere to nearly double the battery life! With the AirVape Xs vaporizer, you can dial in the exact temperature that's best for your material. The elegant LCD display is simple to read, and the controls are intuitive for ease of use. 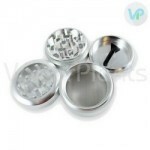 When the vaporizer, loaded with wax or dry herbs, is ready for use, it vibrates to let you know. Ultra flexible, this portable has an automatic shutoff that is fully adjustable, so the length of your sessions is completely up to you. This new model is powered by a custom-built battery to keep the proportions of the wax and herbal vape as slim as possible. Able to power the AirVape through more than one session, the battery features pass-through technology, so you can continue to vape even when it's plugged in. To ensure performance in all types of conditions, each battery has been put through a series of tests for altitude, thermal conditions, and shock. It's even equipped with external short circuit protection for your peace of mind. As mentioned above, the Airvape Xs is a very efficient herbal vaporizer that heats up in just 30 seconds. Sleek and sturdy, it is build with impeccable durability and features a powerful battery life that boasts an automatic shut off timer with a 3-minute countdown which is visible on its screen. It is slim, small and so simple to use, making it a pleasant experience for both beginners and experts alike. The Airvape Xs features a ceramic heating oven that evenly heats your herbs to prevent charring or combustion of any sort. Ceramic also works to keep the flavor tasting pure and unaltered. Before the vapor reaches your lips, it travels through a cool screen system that helps to smooth it out and cool it down. With the ability to transform this vape into a wax vaporizer, this unit is a testament to the notion that big things do come in small packages. Furthermore, the vapes from Apollo come with a limited lifetime warranty! In conclusion it is a truly powerful little vaporizer for dry herbs and waxes. Apollo prides themselves on creations that their customers will love, made from high quality materials, beautiful finishes, great inner workings, and portability to boot. They capture all of that in their tiny AirVape Xs and offer a number of accessories to go with it. Take a look at it above and see if Apollo is the right brand for you! Overall a really great vape - Review by Armandina M.
This AirVape Xs is definitely worth the price that I paid, and I would buy it again. Hits are smoothly - Review by Michael A.
AirVape hits so smoothly and is simple to use. It is just as easy to clean as well which is great because I always look for a low maintenance vaporizer that won't take up too much of my time. Favorite vaporizer - Review by Michael V.
The AirVape Xs is my new favorite vaporizer, and I have tried total of three vaporizers for dry herbs so far. Simple to keep clean - Review by Michelle F.
AirVape is simple to keep clean and it is simple to use. It offers a really nice draw that you don't have to pull too hard on in order to get. It also has a nice auto shutoff feature which is good because I am forgetful and usually forget to switch off the vaporizer after I am done using it. Huge perk - Review by Antonia M.
It is simple to use and you can use it while it is charging which is a huge perk since we like to vape so much. Gift for my girlfriend - Review by James D.
I bought this as a gift for my girlfriend and she is in love with it. We have tried many different vaporizers, but this is by far our favorite ones ever. Decent battery - Review by Constance J. The battery life is only decent which is my only complaint. To counter that though it only takes a little while for it to charge back up again so this is not really a problem. This is especially true when you consider that it has passthrough technology, so I am able to vape it while it is charging. Super fast heating - Review by Lillian E.
AirVape has super fast heating so that I can vape on a whim and the design is nice and discreet so that vaping in public is something that is easily done. Great value - Review by Marvin H.
I love the AirVape Xs because it is a great value for the money. Really compact - Review by Mj P.
It is really compact and super portable so I can take it with me wherever I want to take it. No cough - Review by Debra L.
I have been smoking for a long time and it was starting to get to my throat, so I decided maybe I should start vaping. That prompted me into picking up the AirVape Xs, and I am so glad that I did. This vape does not make me cough nor does it give off any unwanted odor that might ruin my hiding spots when I am outside. Not hot to the touch - Review by Latisha C.
I love that the AirVape Xs does not get too hot to the touch, and it has never overheated and shut off from being on for too long. Looks great - Review by Tarsha K.
I love how it looks and I have gotten a lot of complements about the AirVape vaporizer from my friends that have used it as well. Enough power - Review by Tarsha K.
This AirVape vaporizer has a battery that is powerful enough to power through several vape sessions at once, but wont last an entire day for heavy users. It would be enough power for an individual, without needing to recharge it too many times. Great customer service - Review by George M.
I recommend this to everyone who wants something reliable. This website has a great selection, thanks VP for assisting me. Happy buyer - Review by Roderick J. The AirVape Xs is something I considered buying for a while and I am so happy that I finally did. It has become a staple in my daily routine.